President Trump will interview former Sen. Joe Lieberman (I., Conn.) for the position of FBI director on Wednesday, according to White House Press Secretary Sean Spicer. Trump is also scheduled to interview Frank Keating, a Republican and former governor of Oklahoma; Richard McFeely, a former FBI official; and Andrew McCabe, the bureau's current acting director after the president fired former Director James Comey, according to Politico. 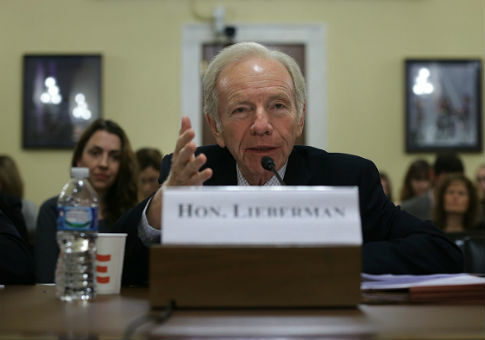 Lieberman spent 24 years in the Senate, entering as a Democrat in 1989 and leaving as an Independent in 2013. He was the 2000 vice presidential nominee when Al Gore ran for president. Senate Majority Whip John Cornyn (R., Texas) called the former Connecticut senator a "brilliant selection." Cornyn had previously removed his name from consideration for the top FBI job. "I think he would get 100 votes," Cornyn said. "Everybody loves Joe Lieberman." "People know he's going to shoot straight no matter what happens, and I think it's a pretty brilliant selection if that's what he does," Cornyn added. But one Senate Democratic leadership aide told Politico that "there couldn't be worse time to take the unprecedented step of handing the FBI over to a politician." "That includes Sen. Lieberman," the aide added. This entry was posted in Issues and tagged FBI, James Comey, Joe Lieberman, President Trump. Bookmark the permalink.